If you are struggling to decide which Droid family member to buy with your early upgrade, then we have the chart for you. 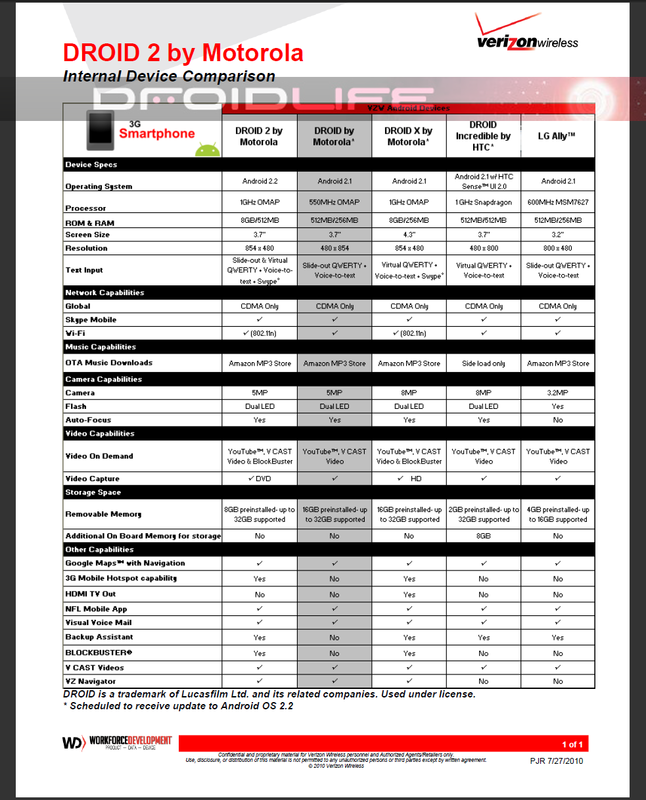 The table above compares the Droid 2, Droid 1, Droid X and Droid Incredible in the simplest of formats and should help you make a decision. The D1 column is highlighted, meaning the Droid 2 is around the corner and VZW employees are being trained into pushing customers toward other devices. The asterisk next to the D1, DX and DI simply mean that they are scheduled to receive Froyo. We just don’t know exactly when. Doesn’t the DI have 748MB of ROM, not 512MB? And yes, the LG Ally is included, we just don’t care. Pretty impressive lineup of phones though wouldn’t you say? DROID 2 to be Announced August 10th, Available August 12th?